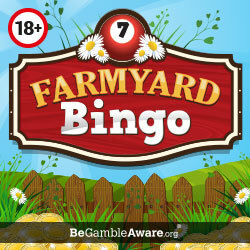 Farmyard Bingo | Claim 120 FREE Bingo Tickets On Deposit Here! If you want to move on to pastures new then come to Farmyard Bingo! You never know this top online bingo site might even turn into a nice little cash cow for you. The registration process is quick and simple and there’s a generous welcome offer waiting for you when you join so it won’t take you long to find out! Continue reading the rest of our review to find out what other perks are waiting for you when you join today! Plough into Farmyard Bingo with their fantastic welcome offer! Create an account and make your first deposit of £10 and you will be entitled to 120 free bingo tickets. There is a prize pool of £1,500 up for grabs each day with this offer, so what are waiting for? Sign up and claim your welcome bonus today! 120 free tickets offer on your first deposit. Play with 30 extra free tickets on your third deposit. Play guaranteed jackpot games every day of the week. Free bingo games and 1p penny games. Get £10 free for every friend you refer. Loyalty rewards and VIP programme. There are plenty of jackpot games and regular promotions up for grabs at this bingo site, and what makes them even better is the fact that no promo codes are needed to claim them! Farmyard Bingo doesn’t have a mobile app but players can still play all of their favourite games on the go with this mobile optimised site. All you need to do is head over to www.farmyardbingo.com on your mobile device and enter your login details and that’s you ready to start playing. If you’re not already a member you’ll need to make up an account then you can use the same username and password across all your devices. Farmyard Bingo goes the whole hog when it comes to providing top quality bingo games and slots. There’s a wide range of 90 ball and 75 ball bingo games for you to plough through as well as the odd 5 line game. If you want to turn up your bingo a notch there’s also guaranteed jackpot games and progressive jackpot games for you to have a wager on. If it’s a bargain you’re after then you’ve come to the right place as there are 4 penny bingo rooms that are open daily. There are also 3 free bingo rooms including the Bingo Academy which is open to non-funded players, so you can play for real cash without spending a penny on the site. The other two free rooms are open to funded players only, however, they feature much larger jackpots of up to £50. Then once you’ve had your fill of bingo, you can break things up a little bit by checking out the slots, scratchcards, and table games on offer. A few of the slots you’ll definitely want to check out are Temple of Isis, Sugar Train, Enchanted Prince, Shaman’s Dream and Piggy Payout. Minimum first deposit of £5. Free bingo for non-funded players. Payment methods include Neteller, Visa, Mastercard, Maestro and Paysafecard. When you request a withdrawal it will take 48 hours to process. Farmyard Bingo will make you squeal with delight as you play their huge range of bingo games and slots and hopefully bring home the bacon. There really isn’t anything to complain about with this site. Not only are the games all top notch but there’s plenty of bonuses for you to spend on them which makes this site perfect for players who like a bargain. So what are you waiting for? Get a moo-ve on and sign up today!